Brace yourself people, my animal print nails are a bit 'out-there' today. 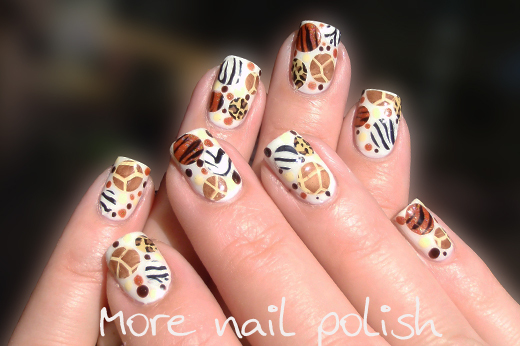 Seeing today's theme, I thought we would see lots of manis featuring zebra, cheetah, leopard or giraffe prints, but I couldn't decide which way to go. I was overwhelmed with choices. First, shall we look at my final, over the top design? I was originally planning on doing a poison arrow frog print because the colours were very bright and funky, but then I did a google image search for the words "Animal Print" and the below image came up after a few pages. 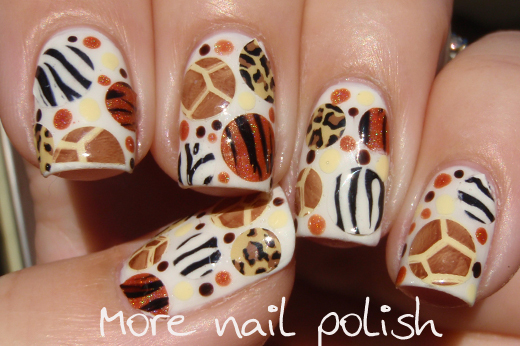 I instantly fell in love with the design and thought I would try recreate it on my nails. I started by creating some stamped decals of each of the prints. I did this by painting polish on a plastic ziplock bag. I painted in white, Picture Polish Mellow Yellow, and Born Pretty Store holo #5. 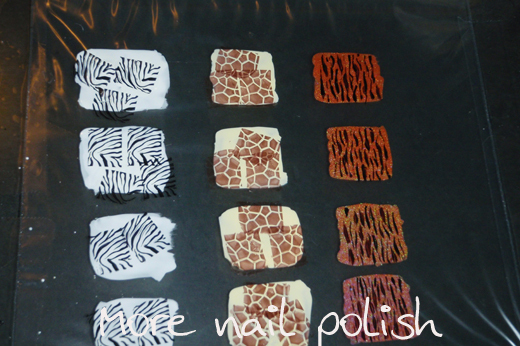 Once they were dry, I stamped black zebra stripes on the white polish, giraffe print using Ulta3 Chocolate Cake on the yellow, and freehanded some tiger stripes on the orange holo. 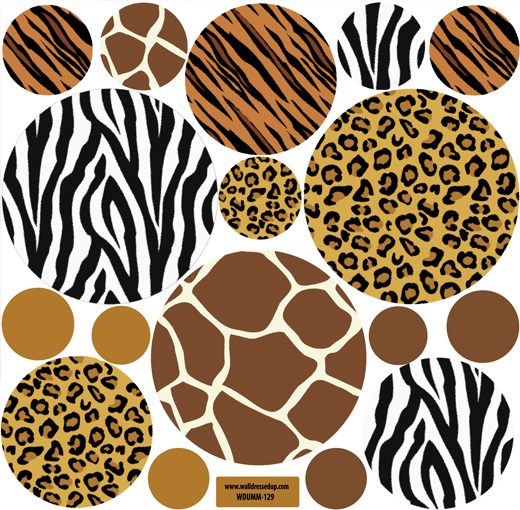 I then used craft hole punches in two sizes to punch out circles of the various designs. 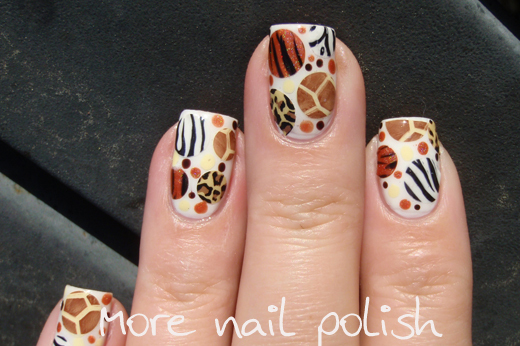 The leopard print designs were cut out from some nail stickers I purchased at Aldi last year. Lastly I added some dots in various colours I had used in the design. Creating the mani was less than an hours work, but that was after the decals were already made. You would need another 20 minutes, plus drying time to create the decals. I got a lot of comments about these nails yesterday. At let me tell you, explaining the process I went through to people really makes it sound like a lot of work. Looking at my nails during the day I realised they could have fit with the dotting theme and interesting they also felt very 'tribal' for some reason too. This was very ambitious of you and it came out great. I am definitely using that technique one of these days! I love this. 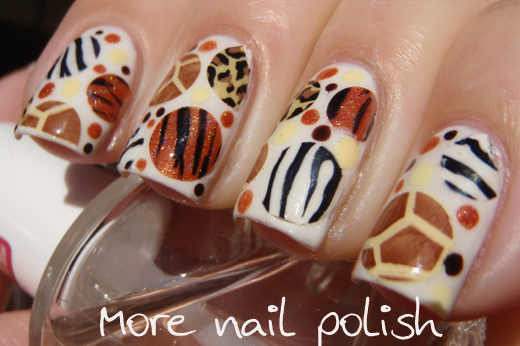 It is a fabulous interpretation of the animal theme. You're so creative Cathy!! These are truly amazing! How cool! 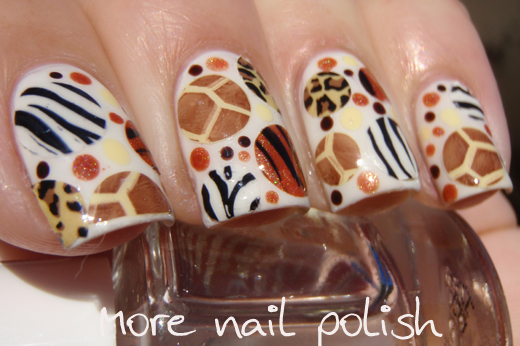 How did you get the dots to stick to the nails? This is seriously so cool, I love it! So so so cute! Really great idea! Love this! I really need to make some of those decals stat! omg, this is great idea! Nails look so fantastic! This is one of the best I've seen. Really creative and a really good job. I looked at that EXACT photo for inspiration, and then decided I could never pull it off! I love how yours turned out though, and I may have to try it using your method! 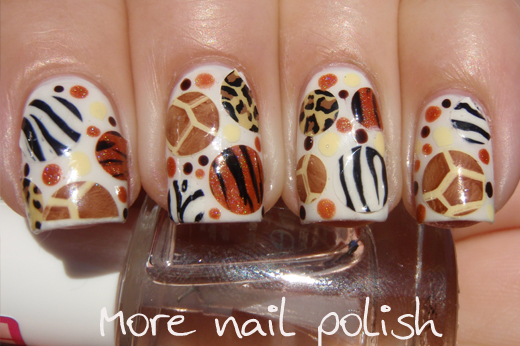 Very cool, it is so great what you can do with polish decals!